We are proud to announce that the 1001 Laurel Residential Association has selected Tinnelly Law Group as its new legal counsel. Located in the City of San Carlos, the 1001 Laurel Residential condominium project was built in 2009 and consists of 90 ultra luxury condominium homes and several street-level commercial spaces. In addition to an expansive central courtyard, the 1001 Laurel residents enjoy great restaurants and shopping all conveniently within walking distance. 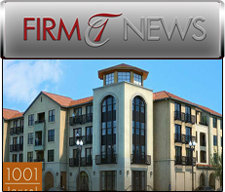 The 1001 Laurel Residential Association is the newest homeowners association to join Tinnelly Law Group’s Bay Area client portfolio. Our HOA attorneys and staff look forward to working with 1001 Laurel’s Board and management.